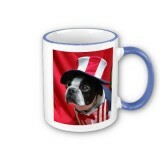 Great patriotic Boston Terrier gifts for those who love the USA. 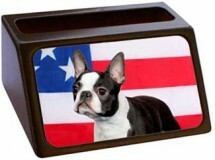 Makes wonderful gifts for Boston Terrier Dog lover for the 4th of July, Memorial Day, Labor Day or any occasion! Items include Partiotic T-Shirts, Cards, Mugs, Totes and figurines. These fine Boston Terrier Gifts are a welcome gift to anyone who loves a Boston Terrier. This charming Boston Terrier Dog named Spanky makes the perfect Uncle Sam in his special patriotic outfit on the front of the Women's Hooray for the Red, White & Blue Boston Terrier T-Shirt. 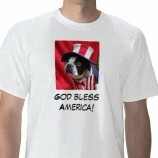 A great patriotic Boston T-Shirt for the 4th of July or Memorial Day for Boston Terrier lovers and all dog lovers! The Women's God Bless America Boston Terrier T-Shirt celebrates the USA in a special way with the cute Uncle Sam Boston Terrier named Spanky in his patriotic costume. A great patriotic Boston T-Shirt for the 4th of July or Memorial Day for Boston Terrier lovers and all dog lovers! This charming Boston Terrier Dog named Spanky makes the perfect Uncle Sam in his special patriotic outfit on the front of the Boston Terrier Hooray for the Red, White & Blue T-Shirt. A great patriotic Boston T-Shirt for the 4th of July or Memorial Day for Boston Terrier lovers and all dog lovers! The Boston Terrier God Bless America T-Shirt celebrates the USA in a special way with the cute Uncle Sam Boston Terrier named Spanky in his patriotic costume. A great patriotic Boston T-Shirt for the 4th of July or Memorial Day for Boston Terrier lovers and all dog lovers! Your Pariiotic Boston Terrier doggie can wear his or her own Boston Terrier Made in the USA Dog T-Shirt for the 4th of July or any time he or she wants to go patriotic. After all it IS TRUE! 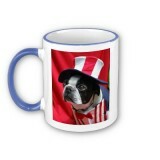 Has the picture of a cute Boston Terrier dressed in their Uncle Sam outfit that will cause anyone to raise the flag! Your pup will be styling in this 5.8 oz, 100% combed, ringspun cotton baby rib tank top.Contrast double-needle ribbed binding on the neck, sleeves and bottom seam provides a comfy fit for your furry friend. Small: weight 4-5 lbs. ; length 9-1/2 in. ; chest 12-1/2 in. Medium: weight 6-10 lbs. ; length 10 in. ; chest 14 1/2 in. Large: weight 11-25 lbs; length. 12 in. ; chest 16-1/2 in. X-Large weight 26-45 lbs. ; length14-1/2; chest19 in. The Patriotic Boston Terrier on Green Business Card Holder is a stylish and colorful, Business Card Holder featuring a Black & White Boston in front of the American Flag. Makes an attractive and functional gift. It is made of wood, is mahogany in color and makes a great desk set together with our Sticky Note Holders. 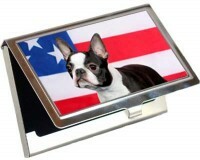 The Patriotic Boston Terrier Note Holder is a decorative place to keep your memo pads. Our handsome Post It Note Holder is made of wood with an aluminum plate sporting your favorite breed of dog. It measures 4.25"W x 6.25"L x .75"D and comes ready to use, with a sticky note pad. Wear this charming Boston Terrier Patriotic Dog Apron to show your patriotism while you cook! Now you can cook, clean and groom your dog clad in this cheerful Boston Terrier aprons. This bib style apron is made of 100% spun polyester and one size fits all. The apron has a loop neck and braided waist ties. Made in USA. 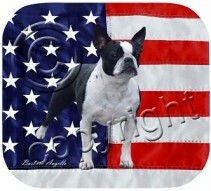 Boston Terrier Patriotic Dog Kitchen Cutting Board is the perfect gift for the patriotic chef! 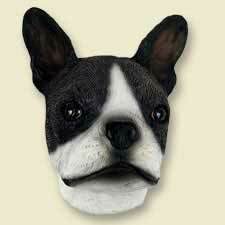 Our beautiful, Boston Terrier dog breed cutting boards will enhance any kitchen. They make great gifts, are made of tempered glass and measure 8" x 11". They are heat resistant, scratch resistant, virtually unbreakable, easily cleaned and dishwasher safe. Made in USA. A trendy Boston Terrier Patriotic Dog Keychain has a Boston in front of the American Flag. It is imprinted on a 1" aluminum disc. This stylish metal keychain is the perfect choice for Boston Terrier dog lovers with discriminating tastes and also makes a wonderful gift. Overall size, including ring is 2.8" x 1.4". Packaged in a black box. These beautiful Boston Terrier Patriotic Porcelain Sterling Silver Pendant Necklace is beautiful and a gift to be cherished by the Boston Terrier Dog Lover! This stunning dog breed porcelain pendant set in sterling silver mount with open back. This beautiful necklace is available in 2 sizes and comes with a 120" Sterling Silver Chain. This lovely Boston Terrier Patriotic Wallet features a colorful Boston Terrier in front of the US flag with it's bright red & white strips. A super soft, black, simulated leather, dog breed wallet. This stunning wallet has a velcro closure and measures 7.5"x 4.25". It has a zippered compartment, 2 open compartments for notes and 6 card holder slots. Makes a lovely gift for any occasion!